Facebook Click the Facebook icon below any map to add it to your Facebook page. Become our fan, connect and share with us at our Profile or join our Group. Search for Green Map to follow local Green Map projects, too. Twitter Follow us at greenmap or here. It's fun. Albums Find a great global selection of photos at GreenMap.org/album. Slideshow You can view this Slideshow PDF larger by clicking the link (or download it here (low resolution). On the bottom of this page, you'll find 2 more slideshows you can use to present our global program and outcomes of Green Mapmaking since 1995. Presentation Guide With so many ways to present this social mapping website, we have created a guide to help you anticipate problems and have a great presentation! Download it here. 3 images that help you learn how to use the map, its sidebar and the sites on it. 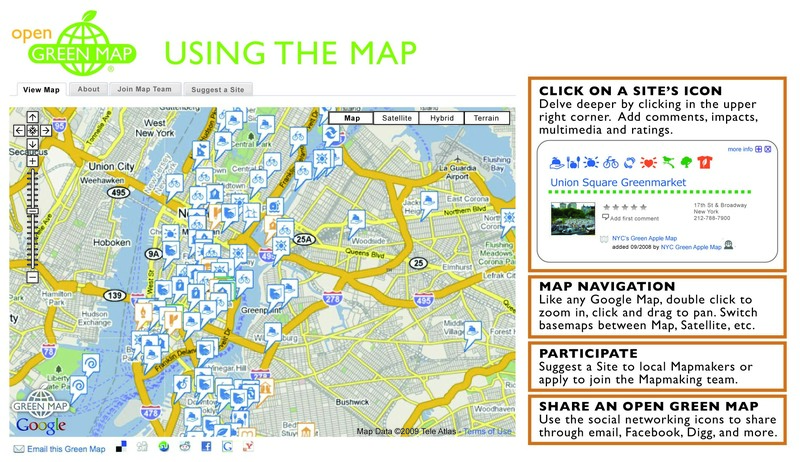 Map Features shows find out how you can share a map, join a map team, or suggest a site. 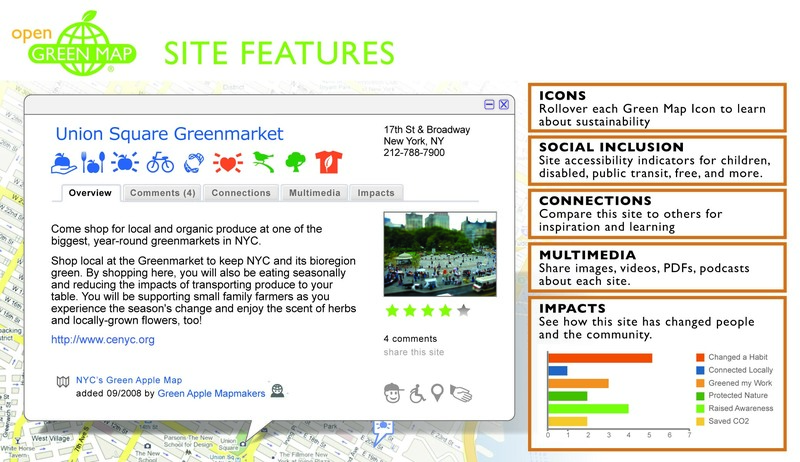 Site Features help you find all the information, impacts, media, etc. about each site. Legend Features include the whole sidebar, so you can get familiar with how the Legend functions, find out about the Mapmakers, and use the search box to find related and nearby Open Green Maps. Each blue link is 1 MB JPG. If you would like the high resolution version, click to download a zip file with all three images 6MB). Or, download a 2 page flowchart here. Video Resources Watch or present a 2.5 minute short about how to add a site to an Open Green Map and a 3 minute short about why to make an Open Green Map. The Open Green Map can be used by students to explore the world or to create new Green Maps. For an introduction to using this platform in the classroom, review the Green Teens project-in-development slideshow and our Educator Resources flyer. For an overview of our youth Green Mapmaking program, click GreenMap.org/youth. Find out about our resources, download ready-to-use modules and see locally-designed youth-made Green Maps created in classrooms and out of school programs in 20 countries. Site Suggestion Form (Offline) At events, it's easy to give people a form to fill in offline. Customize this one to include your map's short URL, contact info and project goals. Download a .doc here. 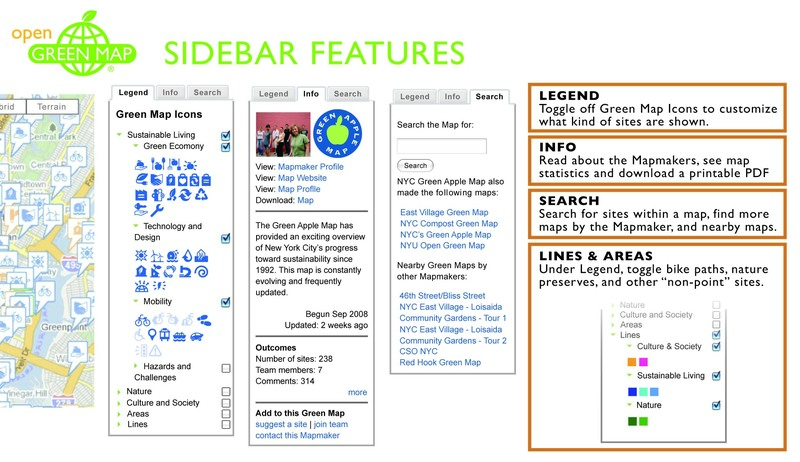 More widgets are coming soon, but the easy way to embed an Open Green Map in your website or blog is with an iFrame. In this line of code, change the width and height to fit your page, and change the URL (website address) to the map you want.